Tokai Forum - a subsidiary of TokaiRegistry.com :: View topic - Why aren't you bothered that it doesn't say GIBSON? Why aren't you bothered that it doesn't say GIBSON? Posted: Wed Nov 11, 2009 7:16 pm Post subject: Why aren't you bothered that it doesn't say GIBSON? Ok, probably not an issue if you're on this forum right! But I have buddies that just have to have that Gibson or Fender name on the headstock. All my Nihonjin buddies wouldn't take a Navigator or a Tokai or a Greco if you gave it to them! And that's cool, I can't fault them for that. I'm that way about certain things too I guess. But guitars, man, I'll play all the good ones. 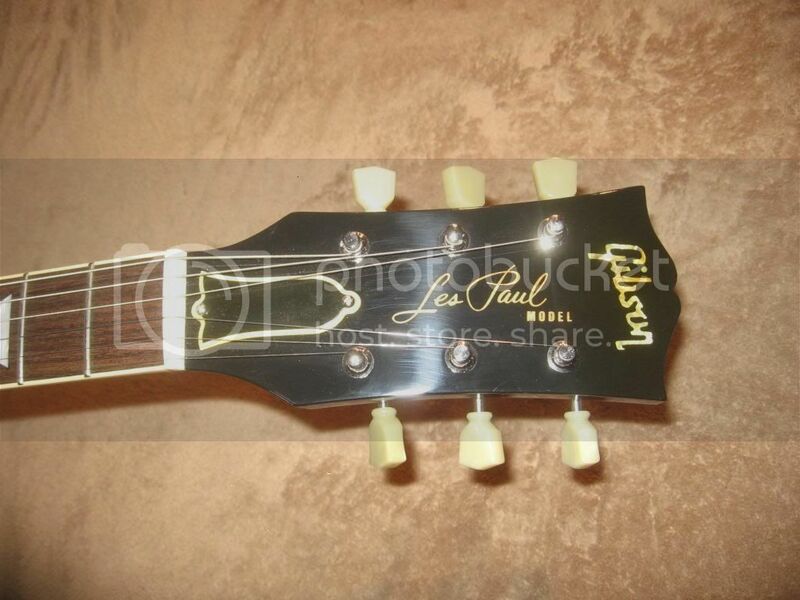 I don't care who's name appears on the headstock! I have Edwards and Tokai and Fender Japan and Gibsons and they are all cool! I play out with my Tokai LS custom and actually have had guys come up and say "That's a copy!" like it was a filthy thing and I was busted! My #1 happens to be a Gibson standard that I stumbled into and the stars aligned on the day it was made. Just a '99 swiss-cheese standard but sound and playability-wise it's perfect?! I've had some really really bad Gibsons in my hands too (as I'm sure many of you have). Like the guys in Nashville were drunk! I'm drawn to Tokai because of their consistency. As I'm sure many of you are. And I have a beautiful flame top for less than what I'd have to pony up for a new GIbbie standard. I guess if you're into trendy labels then get the Gibson. If you're into music get what sounds good. Do you drive a porsche and wear Jimmy Choos too? I'm not bothered because no matter what the name says my Tokai is the best Les Paul I've ever played. Funny you should mention. My first Tokai actually says Gibson on the headstock. It was so well done it became a buying point for me... That everyone would think it's a Gibbo, then I tell them no it's a Tokai, and then they're like "really?" "No way." Nope, it's a Tokai . I'm kind of the opposite of most people I guess. I like having an obscure name on my headstocks, Seymour Duncan being my favourite. OK, not an obscure name as such, but an obscure name on a headstock. The idea of having a Fender Custom Shop equivalent guitar for the price of a Mexi-strat appeals as well. One part of it comes from having lived in countries (Australia, NZ, UK) where the American brands are ridiculously over-priced, leading me to look at cheaper alternatives. The other part is that I'm morally opposed to intellectual property rights, but that is a whole other story. yeah, same here at the start i was annoyed that all these good brands were so cheap, then i realised it meant i could buy them cheaply so I got over it rather quickly. I wouldn't necessarily say I'm morally against intellectual property, in fact I'm probably in favour of it, to a certain extent anyway. If you invent something good, you should be rewarded. I'm just against it when it's used as an excuse for profiteering, and as an excuse to sue/prevent competition. I'd be bothered if it said "Gibson". I think Tokai is a cool brand. If people choose to believe that I play a Tokai because I can't afford a Fender, well that's up to them isn't it? I won't lose any sleep over it. man, that's great dude! I should have that done so that when someone goes "that Gibson is awesome" I could flip it over and show the MIJ stamp Ok, I won't do that...but it sounds cool! "Why aren't you bothered that it doesn't say GIBSON?" Because I already have a Gibson and happen to think that Tokai are better! I think that the way this thread is shaping up is that quite a few of us have actually owned Gibsons in the past so we have had the opportunity for comparison. So when we say that the Tokai that we own now is a superior guitar to the Gibsons that we have owned...we know what we're talking about. And I have a beautiful flame top for less than what I'd have to pony up for a new GIbbie standard. You're getting a replica that is constructed NOT as the modern LP is but as the '59-60 model was for FAAAAAAAAR less money. I actually thought I'd bought a Gibson. It turned out I needed new glasses. 'We've put guitar technology back 50 years".